Does it hurt when you turn your head? Does your neck feel stiff and restricted? Does your neck creak when you move it? Is it sore in your shoulders? Do you have pins and needles in your arms or hands? These are typical symptoms people complain about when they first come to see us. Quite often they are anxious because they think there is something seriously wrong or they are nervous about what we may find. There is hope! 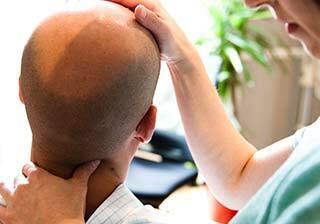 We are friendly, informative and very experienced in helping people with neck pain. We have helped many people with relief from their pain and quite often sooner and better than they expected. If you are suffering with pain, do not feel afraid to contact us. We will help get you on the path to recovery and get you relief from your pain as we have done with so many before you. Do you want your pain to go away? Why don’t you come in to see us so we can find out what is wrong and how we may be able to help you. Relief may be sooner than you realise! You can call us on 0151 707 8111 or send us an email. Many of us will have neck pain at some point in our life. This can be anything from a mild discomfort to severe, disabling pain. The pain can be in your neck or across your shoulders. You may also have stiffness, headaches or other associated pains. You may find that your neck pain is affecting your day to day activities. For some people their neck pain can persist for a long time (chronic) impacting their quality of life and work. In most cases of neck pain, the cause of the pain is not due to a serious disease but due to mechanical problems to do with the musculoskeletal system. This means your neck pain may be originating from your spine and muscles. Neck pain can come on gradually and slowly for some. This could be due to poor posture or wear and tear of the joints. Or your neck pain can come on very suddenly and quite intense. This is usually due to strains, injuries or sleeping in an awkward position. If you are suffering from neck pain, chiropractic may be the answer. We are experienced in spinal healthcare and we’ve helped many people with pain relief, without the use of drugs or surgery. Chiropractic focuses on mechanical problems of the spine. A consultation with us will help identify the cause of your neck pain and if yours is a chiropractic case, we can then recommend a suitable treatment plan. We also give you specific advice on exercises and lifestyle or workplace adjustments. If you are suffering from neck pain, why don’t you get in touch? Relief may be sooner and easier than you realise! You can call us on 0151 707 8111 or send us an email. The most common type of neck pain is Mechanical Neck Pain and is usually due to problems with muscles, ligaments, discs, nerves and joints in your spine. This may include minor strains and sprains to muscles or ligaments, joint irritation or restricted joint movement, nerve irritation or pinched nerves. Neck pain may also come from areas near the neck such as your upper back and shoulders. Many things can trigger neck pain. Usually, everyday activities are to blame. Such activities include bending over a desk for hours, having poor posture at work or while watching TV or reading, placing your computer monitor too high or too low, using your computer for long periods without a break, sleeping in an uncomfortable position or twisting and jarring your neck while exercising. Worry and stress can also cause or contribute to neck problems. Cervical Spondylosis – Degeneration, arthritis or ‘wear and tear’ of the spinal bones (vertebrae) and the discs in between the vertebrae. It is a common cause of recurring or persistent neck pain especially in older people. However, some people can have degeneration without getting neck pain. Another name for degeneration in the spine is Osteoarthritis. Cervical Radiculopathy – ‘pinched’ or ‘trapped’ nerve. This is when a nerve is pressed on or injured as it comes out from the spinal cord in the neck (cervical) region. As well as neck pain, you may have numbness, pins and needles, pain and weakness in your arm. These other symptoms may actually be the main symptom rather than the neck pain. The most common causes of a radiculopathy are cervical spondylosis and a prolapsed disc (slipped disc). Disc Prolapse or ruptured disc – the softer inner gel of the disc bulges or leaks out (prolapses) through the outer harder part of the disc. This can press on the nerve as it passes out of the spine. Spinal Stenosis – narrowing of the spinal canal, can be a complication of arthritis. Trauma or injury – from involvement in contact sports, car accidents, horse riding, diving or falls. Torticollis – sometimes called a ‘wry neck’. A torticollis is when the head becomes twisted to one side and it is very painful to move the head back straight. However, it may also be due to a minor strain or sprain to a muscle or ligament in the neck. Scoliosis – abnormal curvature of the spine. Facet Syndrome or ‘crick in the neck’. * The above is intended as general information only. We do not purport to treat all the conditions listed. Your Chiropractor is highly qualified to find out the cause of your neck pain. As Chiropractors, we deal with mechanical problems of the musculoskeletal system, with particular focus on the spine. If your problem is not a chiropractic case, we will then refer you to your GP or an appropriate health care specialist. Your neck is made up of the cervical spine and the muscles and ligaments that surround it. Your cervical spine is made up of seven bones called vertebrae, numbered C1 to C7. Between each of your vertebrae is a disc (intervertebral disc), made of a tough outer layer and a softer gel-like inner part. The discs act like ‘shock absorbers’ and allow your spine to be flexible. Strong ligaments attach your vertebrae and discs together giving it extra support and strength. A number of muscles are attached to your cervical spine enabling your spine to bend and move. The spinal cord contains nerves carrying messages to and from the brain and is protected by the spine. Nerves that come out from between the vertebrae in the neck, take and receive messages to the neck and arms. Preventing neck problems is about maintaining the good movement in your neck and reducing stresses on your neck. Having regular chiropractic checkups will help keep the joints moving better thus reducing recurrences of your problem. Improve your posture, especially if you sit at a desk all day. Sit upright. Keep your back supported. Adjust your computer monitor to eye level. This prevents you from continually looking up or down. Reduce stress and tension. Relaxation techniques and regular exercise can help. Do gentle neck stretches and exercises (stop if you experience pain). If you work at a computer, have a break every hour or so and stretch your neck. If you are on the phone a lot, use a headset. Improve your sleeping conditions. Make sure your pillow is properly and comfortably supporting your head and neck. Try not to use more than one pillow. You may need a special neck pillow. Make sure your mattress is firm enough. * The above recommendations are not a replacement for professional advice.